With nonstop daily schedules, it’s almost impossible for a lot of dog owners to spend quality time with their dogs. Most pet owners would love to be able to take their pets with them but using a crate or carrying their dog is just inconvenient and tiring. With the use of dog front carriers, people are now able to spend more precious time with their pets and they no longer have to deal with the lugging around heavy bulky dog carriers. Dog front carriers are gaining popularity with customers and there are many types and fashions to choose from. The following best dog chest carriers are able to make life much easier for you and your dog. Using the outward hound carrier will help to ensure that you and your dog are comfortable and your dog is kept safe. 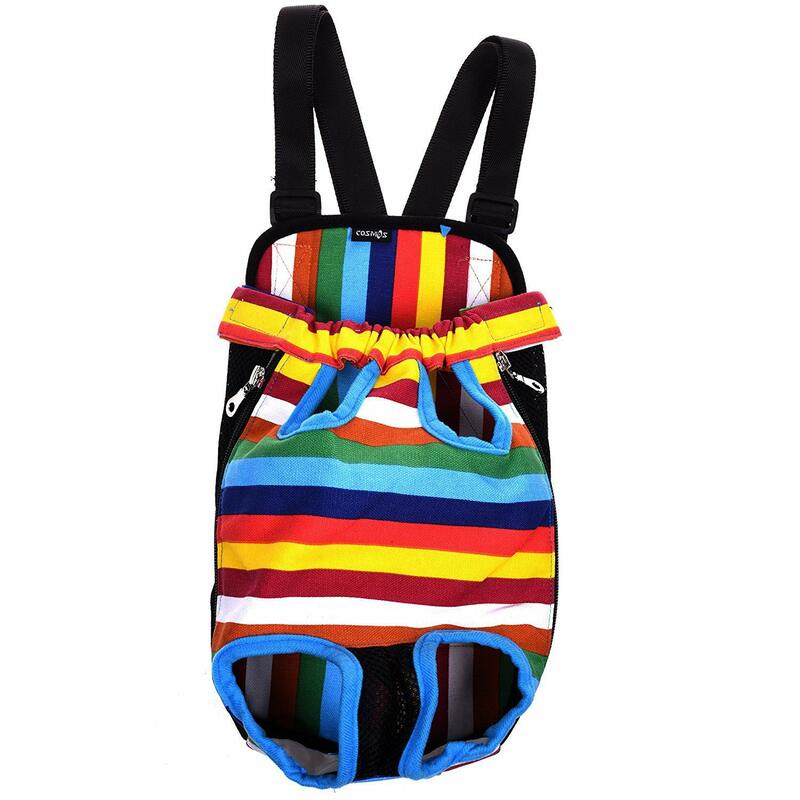 Whether you are biking, walking, shopping or traveling, the perfect puppy front carrier is out there waiting for you. We have listed the top 3 dog front carriers and if one of them isn’t the right fit for you we have also listed some alternative options. We have thoroughly researched these carriers to ensure that they are some of the best dog front carrier options available. Having all of the pertinent information that you need in one place will help you choose the right puppy chest carrier for your specific needs. We have compiled a list of data on all of the listed carriers to make it easier on you to find the perfect accessory for you and your dog. Your dog will look so cute in the COODIA Front Dog Carrier. 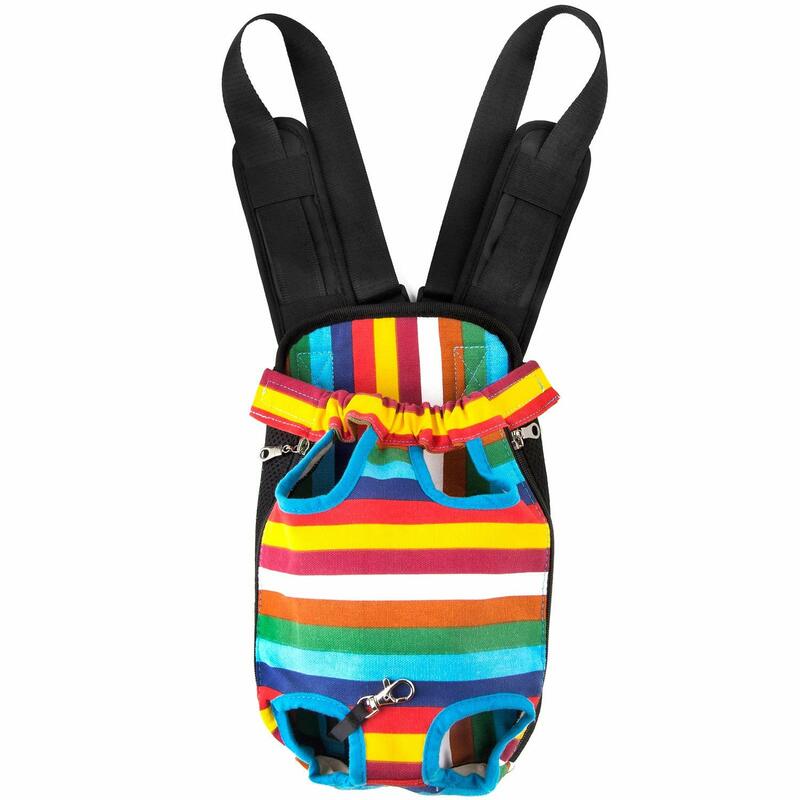 This adorable front facing dog carrier is fashionable, affordable and lightweight, weighing only 9 oz. The front pack design allows you to carry your pet without your arms getting tired. This also allows for your arms and hands to remain free so you can complete other tasks. You can also use this dog Bjorn as a backpack. The COODIA Front Dog Carrier is great for all types of daily activities from walking, biking to shopping. It includes a small pocket that will allow you to carry some well-deserved treats to keep your furry little friend happy. The unique design of the COODIA Front Dog Carrier allows both your dog and yourself to be comfortable. The wide adjustable padded straps allow for a more comfortable experience. The padding helps to protect your shoulders from being cut by the straps. The dog front carrier legs out design helps with your dog’s comfort. Being able to carry your pet helps to ensure their safety from other animals and keeps their paws protected from hot concrete and asphalt. COODIA Front Dog Carriers are available in several sizes from small to extra-large. They can be purchased in blue, black, red and orange. Both sides of the carrier are made from a mesh fabric for better ventilation allowing your puppy to stay cool and not overheat. You can easily take your dog in and out of the carrier thanks to the two side zippers. This carrier also has a built-in safety lock that will keep your pet from flopping around. Some of the most prominent complaints with the COODIA Front Dog Carriers are with their adjustable shoulder straps. Although the straps are padded they are still uncomfortable for some users and shouldn’t be used if you are wearing a tank top or comparable shirt. The straps are made from a smooth material that doesn’t allow the straps to stay taut. There is a clip that is supposed to secure the straps, but it can easily come undone. Another notable issue with the design is that some dogs don’t seem to be comfortable. The opening can be too big for some dogs allowing them to slip out if you bend over. The other issue is with the Velcro hook and loop fasteners. These fasteners are used to help secure your dog and to aid in keeping the zippers zipped, but they are weak and don’t want to stay hooked together. These will probably need to be replaced over time. You will be able to carry your dog around in style with the Whizzotech Front Dog Carrier Backpack. This fashionable carrier is comfortable, breathable, durable and very easy to use. The design of the front chest dog carrier allows your pet’s legs and tail to be unrestrictedly permitting them to be comfortable. The ease and comfort of use will allow you to carry your pooch around while allowing your arms and hands to be free. This carrier can also be used as a backpack. 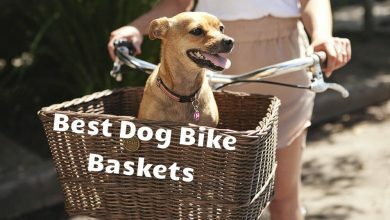 It is great for all sorts of daily activities, and your pup will enjoy doing things with you. The unique design of the Whizzotech Front Dog Carrier Backpack gives you freedom while making sure that your dog is safe and comfortable. The straps are adjustable and can be clipped on and off. The straps have comfortable padding to help protect your shoulders. The secure double zipper design with Velcro elastic safety closures allows you to safely carry your dog around in style. There is also a built-in traction clasp that you can clip your dog’s collar to just in case it tries to escape. Whizzotech Front Dog Carrier Backpacks are available in several sizes from small to extra-large. They can be purchased in black mesh, pink mesh, purple mesh, rainbow, and stripes. The breathable mesh fabric allows for ventilation keeping your dog cool and comfortable. The two zipper design makes it easy to get your dog in and out. The Velcro elastic closure helps to keep the zippers zipped and the dog snuggly secured. With that being said there are a couple issues that people tend to have with the product. The main issue isn’t really with the actual product, but of the sizing recommendations. The suggested sizes seem to run small so make sure that you order the carrier to your dog’s proper measurements. The instructions state that you need to add 1-2 inches for your dog’s comfort. The front pet carrier for small dogs can also run a little small in the dog’s privates region so this might be an issue with some male dogs. The carrier also has a tendency to bounce when you walk. This could have been easily fixed with a simple clasp between the straps allowing you to hook them together and tighten it against you. The only other issue that we came across was that your dog’s fur can easily get stuck in the zippers. It is very important to be careful when zipping your pooch into the carrier as to not hurt your dog or the bag’s zippers. 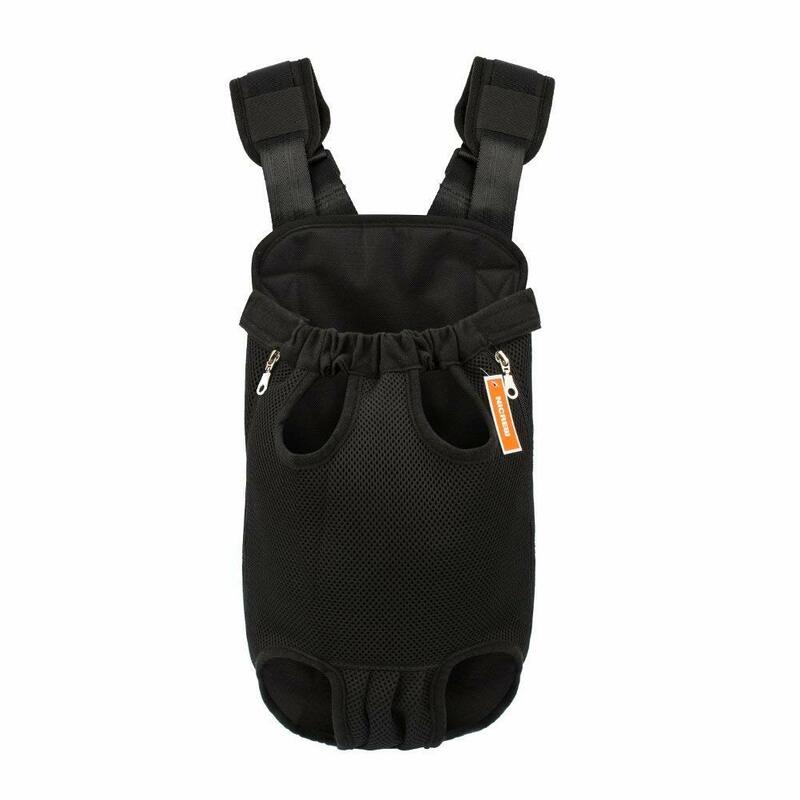 Your dog will be able to hang out with you all the time in the PetBonus Kangaroo Pouch Dog Carrier. This denim style carrier is perfect for carrying your little friend around. The carrier is soft, comfortable, breathable and very durable. The open leg design allows your pet’s legs to hang free for greater comfort. There is also a tail hole so that their tail doesn’t get smooshed from sitting on it. 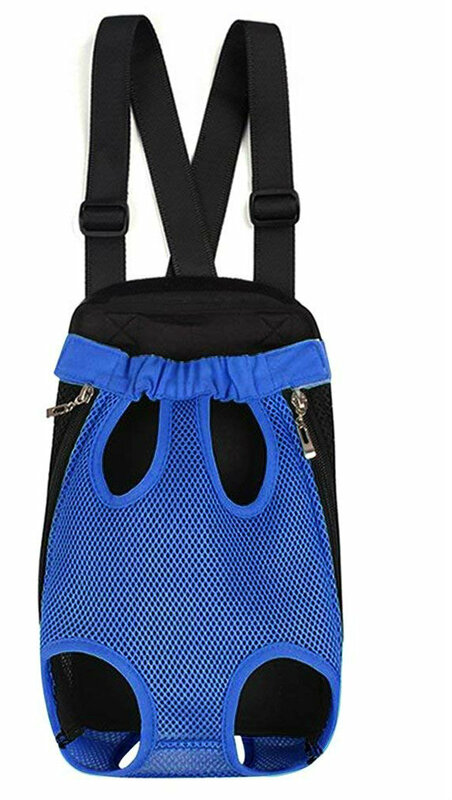 This outward hound front dog carrier is easy and comfortable to use. The design also allows it to be used as a backpack. It is great for walking, cycling, shopping and traveling and hiking. The sturdy design of the PetBonus Kangaroo Pouch Dog Carrier allows you to carry your dog safely without the worry of it coming apart. The straps are adjustable and have shoulder pads that will not allow the strap to cut into you. These pads make it so much easier to carry your dog around since you won’t be dealing with the discomfort from painful straps. 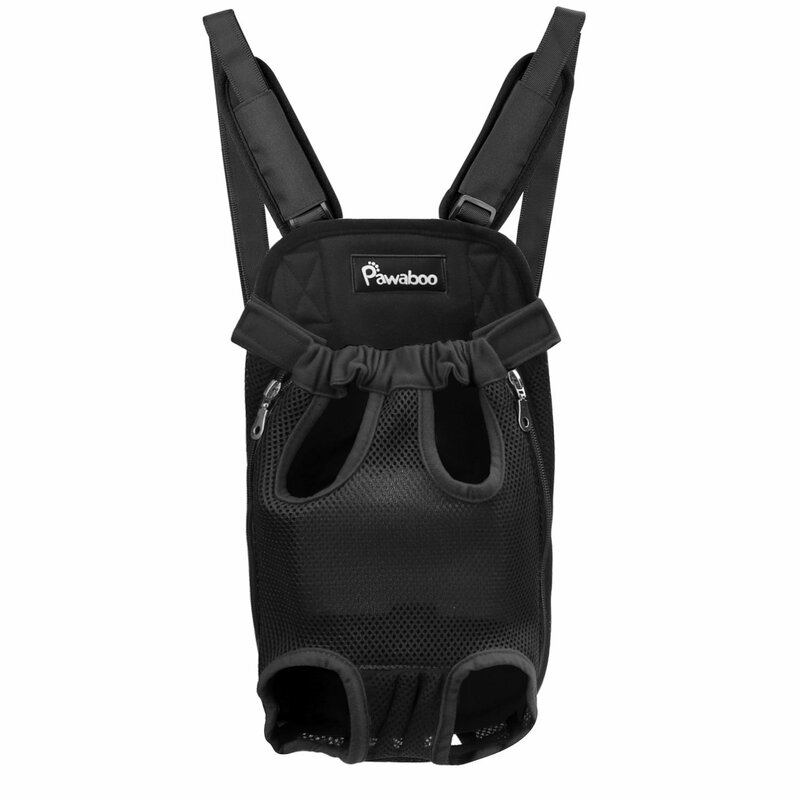 The PetBonus Kangaroo Pouch Dog Carrier features two side zippers for easy use. The adjustable Velcro strap at the pouch opening allows for a snug secure fit. PetBonus Kangaroo Pouch Dog Carriers come in several sizes and are made with soft denim and polyester fiber. They have mesh sides that allow for proper ventilation to help keep your dog cool. The zipper design creates a very easy way to get your dog in and out of the carrier. Given these points, there are still a couple of issues that we have come across while researching this product. The carrier runs small and so do the leg holes. Make sure that you properly measure your dog for the correct fit. Just because your dog usually takes a medium in clothing doesn’t mean that he will take a medium in this carrier. Some people say that their pup looks uncomfortable and they don’t sit correctly in the pouch. This could be a side effect of improper sizing. The other complaint about this product is it only has one style and color to choose from, and that is blue denim. 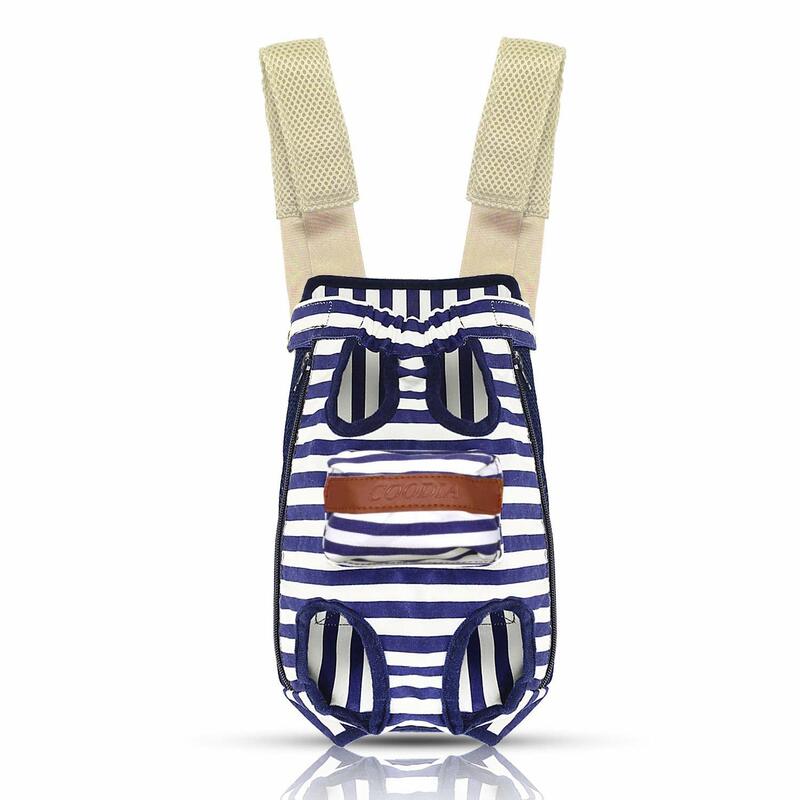 This cute striped patterned design of the Cosmos Dogs Front Carrier Bag will let you carry your dog in style. The carrier is made of canvas and has a soft padded back. We don’t recommend this carrier for long walks due to the fact that the shoulder straps are not padded and they will not be very comfortable after a short period of time. The Dog Carrier Pet Carrier Backpack is lightweight and easy to use. This backpack is durable and is made from a breathable polyester material. This backpack doesn’t seem to have the same amount of support that some of the other carriers do. Since it doesn’t have the proper support some dogs may lean forward causing them to choke. For short trips the breathable mesh GEEPET Legs Out Front-facing Dog Carrier is a great option. The cons with this carrier are that straps are uncomfortable and the carrier’s length isn’t suitable for all dogs causing the pup to lean forward. This can cause a choking hazard or your pup could fall out. The ease of use and comfortability of the NICREW Legs Our Front Dog Carrier makes it a very good buy. The main issue that has been noted with this carrier is if your dog leans forward the zippers can easily come unzipped and the Velcro can come loose causing your dog to come out. Make sure that all proper measures are taken to keep the carrier secure when using it. The PAWABOO Pet Front Carrier Backpack is durable and comfortable and has two mesh side panels for air circulation. The carrier doesn’t offer much support and can cause your dog to lean forward. The zippers are also known to become easily unzipped. Dog front carriers are different from backpacks and dog crates. Using a small dog front carrier allows your pet to have the same viewpoint as you and they are able to feel closer to you. They also tend to receive more attention when they are out in front of you. They get more head pats, kisses and you will talk to them more. Most dog front carriers are designed with mesh material allowing for ventilation for your pup that helps them to stay cool. A dog chest carrier is typically used for walking but they can also be used for all sorts of other activities like hiking and biking. Some carriers can also be used on motorcycles rides. If you plan on taking your dog on a motorcycle ride make sure that you buy the correct motorcycle dog harness to keep them safe. Being carried isn’t always your pups preferred way of travel, but doing so can help with their safety and allows you to be able to accomplish tasks without them taking a bunch of time out of your schedule to sniff everything. Being able to carry your dog protects them from other animals, vehicles and the extreme heat from concrete and blacktop. Besides comfort and ventilation, the ease of use is important. If a carrier is not easy to use it will get put to the side and will never get used. Most carriers are now designed with two zippers that allow for you to get your dog in and out of it without much fuss. These zippers are usually kept secure with the use of a Velcro closure that also has an elastic band that aids in keeping your dog securely and snugly in place. Not all dog carriers are made with the same specifications so pay specific attention to the manufactures directions on how to measure your dog and how to pick the correct size. Just because one carrier works great with one type of dog breed doesn’t mean that it will work with all types. Many people buy dog carriers for the sole purpose of being able to take their dogs on walks. Some dogs can tire easily and if you didn’t use a carrier you will have to carry them in your arms. This can get very tiring for you. It can also be unsafe for them to be out walking where they can easily become prey to other animals. Carriers also make it possible for older dogs and disabled dogs to get out and get some fresh air and to get some well-deserved sniffing in. Using a front pet carrier makes it possible for these pups to get out and enjoy the world without being harmed. Using a dog front carrier allows you to spend more time with your dog and allows them to get outside and get some fresh air. 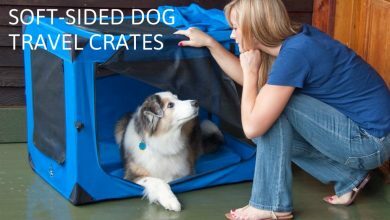 They are also great if you have a small dog that is disabled and cannot get around on its own. Just because the dog cannot get up or be as active as it once was doesn’t mean that it still doesn’t enjoy being outdoors. If you are planning on purchasing a dog front carrier to take your dog on short walks or if you are wanting to take them on a bike ride it is very important that you do your research and purchase the product that will best suit your specific needs. 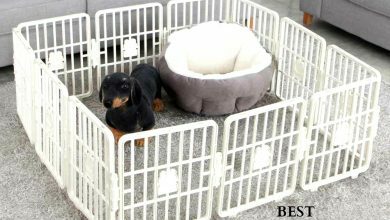 It is essential that you make sure that all the necessary safety features are included in your carrier so that your pup is kept safe and you are kept comfortable. Most front facing dog harnesses carriers work the same way. First, you need to carefully measure your dog following the manufactures specific instructions. This way you can properly fit your pet to the carrier. You want your dog to be comfortable. If the carrier is too small it will smash your pup, but if it is too big they could possibly fall out. Once you receive your pet carrier adjust the straps so that they fit you properly and so that the dog will hang in the correct position next to your body. Put the carrier on before you put the dog into it. Follow the manufactures instructions on putting the straps on. Having the straps in the proper configuration will make for an easy and more pleasant experience. Next, undo the Velcro safety tabs and unzip both zippers. Open up the front flap completely laying it on a table or hard surface. Then place your dog’s legs through the correct leg holes and carefully lift your pup up towards you holding the flap against them. Last, zip up one side and secure the Velcro closure and then zip up the other side and secure it. That’s all there is to it. You are now ready to take your dog for a walk. Each part of a dog front carrier has its own specific purpose. You will want to purchase a carrier that has a breathable fabric, such as mesh so that your dog can stay cool and not overheat. The side zippers make the dog front carrier easy to use and they allow you to get your dog in and out of it with ease. The Velcro closures help to ensure that the zippers stay zipped. This will help to protect your dog from falling out. The elastic collar is there to make a snug fit so that your dog doesn’t flop around in the opening. The straps are a very important component of the bag. They must be comfortable or you will not use the carrier. Having padded straps make the weight from carrying your pup much more bearable. Having the proper padding will stop the straps from digging into your shoulders causing you pain. Leg holes and the tail hole are important to your dog’s comfort. The leg holes allow your pup to stretch their legs out so that they aren’t in a cramped position. If the carrier doesn’t have a tail hole their tail can become smashed causing them to be uncomfortable and this could lead to them being in pain. If you love taking your dog places with you, dog front carriers are a great option. You no longer have to carry your dog in a big awkward crate where they can become fearsome and nervous. 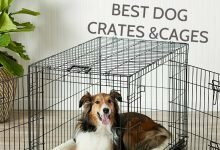 The hassle of moving and storing these types of crates also becomes a problem. Soft-sided carriers are another option, but they have some of the same issues as their predecessors. They can be bulky and can tire your arms out carrying them. Purse tote bags are cute and can draw a crowd, but they are awkward and can get heavy causing your shoulder pain. Thanks to dog front carriers you are now able to carry your dog around without having to deal with bulky accessories, or your arms getting tired. These dog carriers allow you to distribute the dog’s weight and they allow you to have your arms and hands-free. If you aren’t exactly looking for dog front carriers, but you still want to be able to take your dog with you there are other options available. There are the standard backpack type carriers that still allow your arms and hands to be free. There are also hard-sided and soft-sided carriers available that allow your pet to the ability to move around inside. They are also able to lay down and take a nap. If you travel on airplanes there are options available in hard-sided and soft-sided carriers that are approved for most airlines. If you don’t plan on carrying your pooch for long periods or take them on an airplane then purse tote bags are always an adorable option. The most important things to take into consideration when purchasing a front pet carrier are safety and comfort. If you are carrying your pet for an extended period of time you will want to purchase a carrier that has padded straps. Please note that just because a strap is padded doesn’t mean that there is enough padding to stop the straps from digging into your shoulders. If the straps start causing pain you will end up carrying your dog in your arms and that defeats the purpose of the carrier. Padding on the back of the bag is also a bonus. This will aid in your comfort as well as the dogs. A tail hole is essential for your dog. If they cannot stick their tail out they will be sitting on it and that is very uncomfortable and could cause pain. Another nice thing to have on a carrier is a clasp for hooking your dog’s collar. 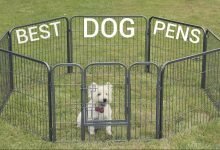 This is a safety feature that will come in handy if your dog ever tries to escape. It is also vital that the zippers are rugged and don’t come unzipped easily. If your carrier happens to come unzipped while you are using it your dog can fall out. For the most part, dog front carriers run under $20.00. 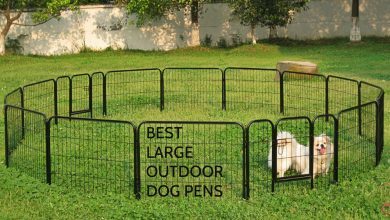 This is very inexpensive considering the extra quality time you will get to spend with your dog. Pet carriers are intended for small to small-medium sized dogs. Carrying around a larger dog isn’t practical and can end up causing you unnecessary pain and discomfort. If you have a larger dog that has a hard time getting around you can use a stroller or a wagon to get them outside to get some fresh air. If you plan on carrying your dog for an extended period of time it is imperative that you take regular breaks. The dog needs its normal bathroom breaks and if it left hanging for long periods of time their legs will go to sleep. This will cause a dog to limp or stand still. Some dogs are very sensitive to the numb tingling feeling when their legs go to sleep, and they might bark or whimper. Did you know that it is estimated that US pet owners spend over $60 billion dollars a year to pamper their furry friends? This number continues to rise every year with no evidence of a decline in the near future. Even during recession periods, pets are still of utmost priority. When purchasing a dog front pet carrier it is important that they are easy to clean. Keeping them clean will help keep your dog healthy and will keep odors at bay. Always make sure that all parts of the carrier are intact and working properly. If you have a rip in the fabric or a defective zipper this can end up being hazardous for your dog and this is unacceptable. Most carriers also have Velcro closures. If these closures lose their grip they need to be replaced. They are used as a safety feature to help hold your dog in and to keep the zipper from coming unzipped. In conclusion, if you are planning on purchasing a pet carrier, dog front pet carriers are a great option. They can keep your pup safe and they also allow you to spend the needed time with them. Not all dogs are a great fit for dog carriers just as not all carriers are a great fit for all dogs. Make sure that you do your research and purchase the best option for you and your dog. Comfort and safety are the most important factors in choosing your carrier. Make sure that the carrier that you purchase is of good quality and it has the necessary features to keep you and your dog comfortable. Also, take into consideration the time you will be carrying your dog and the activities that you will be performing. If you are hiking or walking you don’t want a carrier that is going to bounce. This will end up being a painful experience for you and your dog. With the research that we have conducted, we believe that there are 3 top runners in the dog front carrier product department. The COODIA Front Dog Carrier is very well-made and is available in four different colors. The padded straps add extra protection for your shoulders and the small pocket comes in handy for carrying a few treats for your pet. 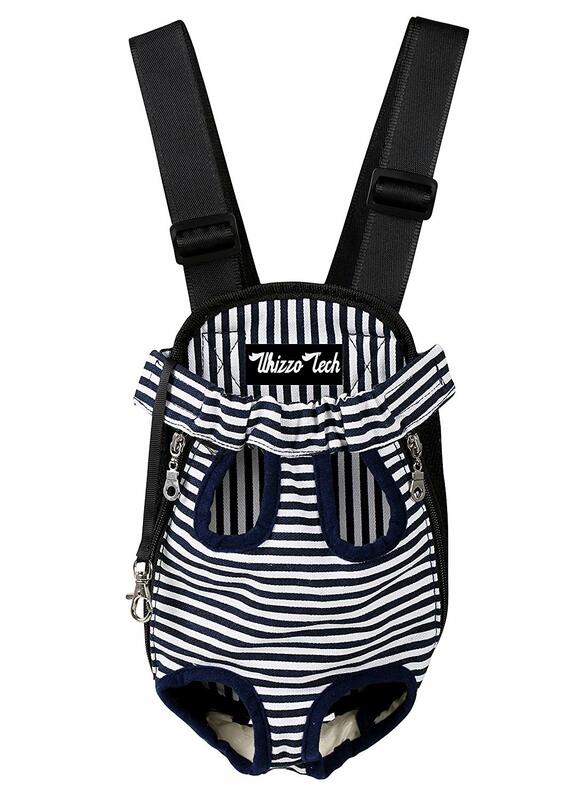 The Whizzotech Front Dog Carrier Backpack is a very fashionable accessory and there are 5 designs that you can choose from. The ease of use and the adjustable padded straps that can be unclipped are a great feature for this product. It also has a clasp that allows you to clip your dog’s collar for added safety. 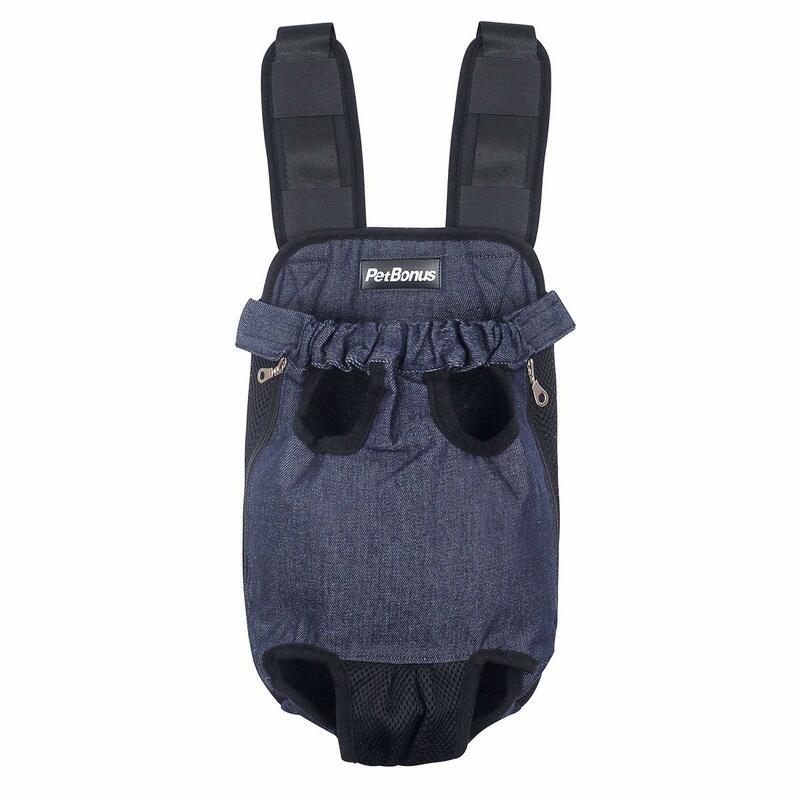 The PetBonus Kangaroo Pouch Dog Carrier is a cute denim design that is soft and comfortable for your dog. The denim material is very sturdy and includes breathable mesh sides. The straps on this bag have an ample amount of padding allowing for greater comfort while carrying your dog. Front dog pet carries are a great option when you are trying to spend some more time with your dog. The ease of use and cute designs make these the go-to carrier. 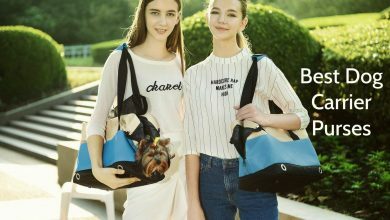 There is no doubt that people will stop and admire your adorable pooch in its new dog baby carrier.